The Best Uncle, Pretty Christmas Tree and Linkup. Today I am co-hosting Tuesday's "Bloggers who have inspired me" with RACHEL from Garay Treasures. Over the last year this life+style blogger has become a good friend. Besides blogging 3-5 times a week, Rachel is a very busy wife and mom of four little ones. Each week she selects 5 of her favorite posts who have linked up the previous week. Today is her last linkup of 2015 so please make sure to join it. Thank you. Today, I have some special Christmas Pictures for you all. They are taken at my brother's house a couple of weeks ago. My brother just bought his first home a few months ago and I am so proud of him. He also bought his first Christmas tree which he beautifully decorated himself. All the ornaments and decorations I gave to him from my huge collection of Christmas ornaments through the years (most of which were new in unopened boxes). For Vivian's and I's festive Christmas Outfits we have on a couple of Black Dresses which are perfect for the holidays. This is Vivian's New Fair Isle Sweater Dress (Black with Fuchsia) which I paired with her New Pink Tights with small White Bows off the side. I am wearing my Velvet Bodycon LBD which I paired with Crystal Accessories (Headband, Statement Necklace and Cuff Bracelet). And if those Red Argyle Tights don't say Christmas to you, they are not doing their job lol. They are light nylon tights and of course Black Booties finished off my look. For my makeup I chose a smoky gray+brown eye and red lipstick. My brother is such a special uncle. He is so kind and genuine and I know for a fact he will make a great father one day because he is great with kids. Vivian smiles and laughs ear to ear when he is around (as today's photos prove, also). He makes her laugh so hard, he makes her so happy, he plays with her, he teaches her many things, he brings her presents often and when he visits us he always brings McDonald's french fries for her - which are her favorite. He is really the best uncle he can be. This year, I ordered 3 special ornaments to go on his tree: one that says "best uncle", one that has Vivian's name and birthdate since his niece is a very important person in his life and one that featured a home and a key and says "proud home-owner". He appreciated them and they are currently hanging on his Pretty Christmas Tree. He did his tree in mostly Classic Red+Gold+Green Colors. The two large Musical Notes, the Red+Gold Ribbon in the front and that Handsome Gold Santa on top, definitely stand out! My brother was the perfect host. He had made steaks with fried hashbrown bites for us, a few snacks and appetizers and of course he had beer but he also offered us (by us I mean myself and my parents) some really good 30-year old scotch too. We watched the Pistons' Basketball game. My brother and I are huge Pistons fans. They beat the Lakers, badly. That's all I have for today everyone. Please join the linkup, after the line. Also, if you missed yesterday's post, go take a peek. It is my favorite post of this entire Holiday Season. If you want to see adorable babies and toddlers who will make you smile, then go for it! Have a Happy before-Christmas Tuesday! *There will be no link up next Tuesday, instead enjoy time with your families and friends and MERRY CHRISTMAS. Featured bloggers from this particular link up will be chosen on Tuesday, January 5th. Meet your Host: Rachel of Garay Treasures blog: Rachel is a former full time preschool special education teacher turned full time stay-at- home mom of four children with a passion for substitute teaching and blogging at Garay Treasures on the side. Garay Treasures is a fashion and lifestyle blog with some added posts on faith and everyday treasures. Rachel loves drinking several cups of coffee a day (hot or iced), blogging, and reading and playing with her children. You can follow Rachel by bloglovin, Instagram, Twitter, Facebook or Pinterest. "As a very busy mom of an almost-three year old who works part-time also, I am always looking to stay stylish and elegant without breaking the bank. I am a budget shopper who almost never pays the full retail price. If you are looking for easy but chic mom every day style and you want to see a cute toddler girl in her adorable outfits, or if you are looking for an easy recipe or a fun Christmas post, you have come to the right place. 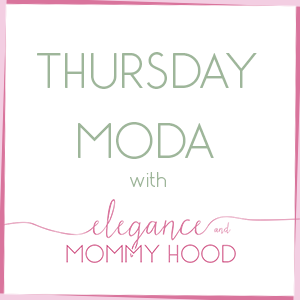 Welcome by my blog Elegance and Mommyhood and let's be friends! You can also follow me on Bloglovin or Pinterest. Happy Holidays and Merry Christmas to All!!" Now on to the featured five from last time and link up: I loved Shea's tips on how to look holiday ready without having to be fancy at it. Check them out here. I was SUPER excited that this lovely lady above made a blogging comeback as I have missed her witty and fashion filled posts. Check out her first back to blogging post here. Amanda is new to the link up, but I loved her layering of a vest over plaid look. Something I am going to try with my white faux fur vest this week. See and meet Amanda here. The tee says enough, I am obsessing over it and made quite the conversation starter with family members over what I would like for Christmas, all thinks to Whitney. Sarah linked up two adorable maxi dresses she styled along with some facts on Dressember and Human Trafficking (which I find awful) check these out here and see how you can support this cause. Now it is your turn, please follow the rules below and enjoy! 1). Please link up recent posts and include the link up button or post this URL link back on your blog. The posts can be about fashion, DIY projects, recipes, inspiration, tips, etc. *If you link up other link ups or giveaways please be sure you share this link up on your link up post to share the blog love and I will be sure to link up to yours. Also please follow me in the below social medias and let me know how you are following and I will follow back. Thank you! 2). Please follow your host Rachel of Garay Treasures either by Bloglovin, Instagram, Facebook or Twitter or all. Comment below and let me know how you are following so I can follow back. 3). Stop by and check out the other bloggers who have linked up and be inspired. 4). Have fun! Comment below if you have any questions! Thanks for linking up!